Hồ Thuỷ Tiên is an abandoned water park in Vietnam. It was built in 2004 in an edge of the Vietnamese city of Huế, to the tune of approximately $3 million dollars. The idea was to create a family water park with amusement rides, slides, pools, shows, and an aquarium. But when the park opened its gates to the public, it was only partially completed. After its opening, an excited population of park-goers began flocking to the park. But, somehow, it wasn’t enough. Within just a few years after its opening, the business started to experience financial problems. It closed not too long afterward and everything that had been built on the site had just been left as it was. 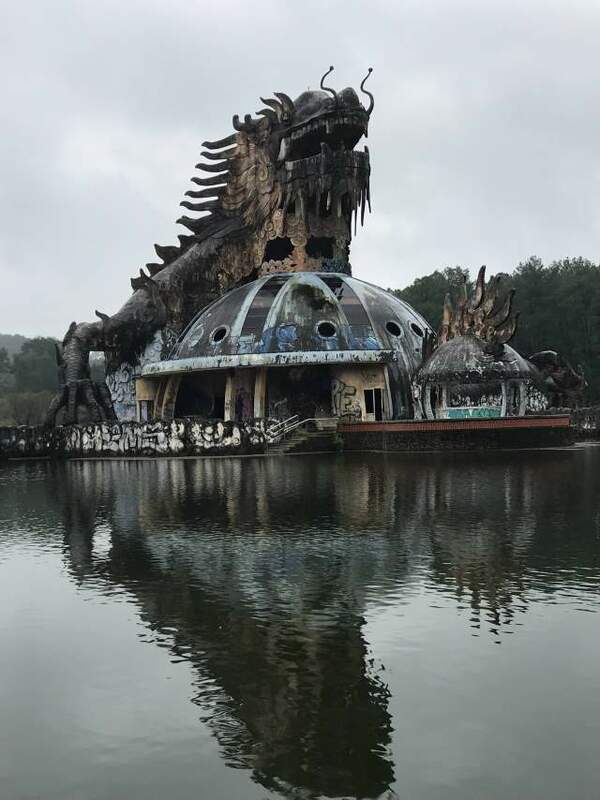 Upon entering to the Hồ Thuỷ Tiên water park, visitors were greeted by the guardian of the park: a full-bodied dragon perched on a spaceship-type aquarium. Upon entering, visitors were greeted by the guardian of the park: a full-bodied dragon perched on a spaceship-type aquarium. On all sides of the dragon’s bowels were aquarium tanks full of living fish and crocodiles. Now, this three-story building is still there but is now covered in rust, peeling paint and graffiti. The body of the dragon body forms a staircase, and today, still, visitors can walk up to a spectacular viewing area and take in the stunning view of the Thuỷ Tiên Lake from inside the mouth of the fire-breathing creature, which is actually a balcony. The park is about eight kilometers from the tourist area of central Huế, a city in central Vietnam. The city of Huế was the seat of the emperors of Nguyễn Dynasty, the last ruling family of Vietnam, from 1802 to 1945, and capital of the protectorate of Annam. A major attraction is its vast, 19th-century citadel, surrounded by a moat and thick stone walls. It encompasses the Imperial City, with palaces and shrines; the Forbidden Purple City, once the emperor’s home; and a replica of the Royal Theater. The city was also the battleground for the Battle of Huế, which was one of the longest and bloodiest battles of the Vietnam War. You can also watch the video titled “Best things to do in Huế, Vietnam: exploring the abandoned water park” below.